This is the second article of a three-part series about the Iranian Question – that is, the question of how the world is going to deal with the Islamic regime’s pursuit of a nuclear bomb, which is likely to be one of the defining processes of global geopolitics in the next five years. The first part, The Approach of the Next Persian Empire, attempted to paint a picture of the internal structure, trends and divisions within the country. This article will analyze the geopolitics of the region from the perspectives of the key players (Iran, the US, Israel and Russia) in greater depth and will try to assess the chances of dissuading Iran from going nuclear. This effort will likely fail, in which case Israel will probably decide it has no choice but to strike against Iran’s nuclear facilities. The consequences of this, which will draw in the US into a full-fledged aeronaval war with Iran, will be explored in the third part. Read the Conclusions at the bottom if you don’t want to slog through this rather quickly and poorly-written text. 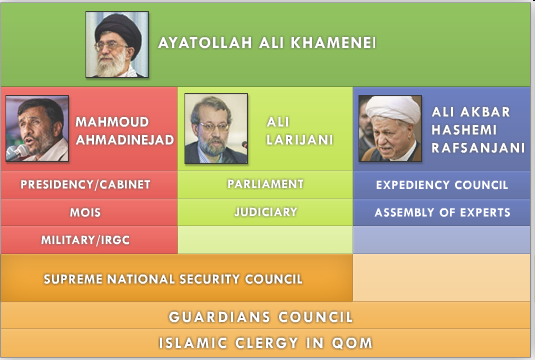 To recap from the first article, the most important things to know about the Iranian political system is the following: a) it is “a unique hybrid of Velayat-e Faqih (rule by Islamic jurists) and modern parliamentary democracy”, b) it is deep, murky and highly factionalized along the following lines: The old, corrupt clerical elites centered around Rafsanjani (chairman of the Assembly of Experts), the conservative technocrats represented by Larijani (Majlis speaker), and the Islamist hardliners represented by President Ahmadinejad, to whom answer the Armed Forces (Artesh) and the Islamic Revolutionary Guards Corps (IRGC) paramilitary / militia / intelligence service, c) these factions are supposed to be balanced by the Supreme Leader, Ayatollah Khamenei, but his sympathies clearly tilt towards the hardliners – which partly explains why they have been in the ascendant since Ahmadinejad’s electoral win in 2005, d) this ascendancy was reinforced by the state’s paranoia over the abortive “Green Revolution” in support of the defeated Mousavi in 2009, who is Rafsanjani’s creature and e) pro-Western liberals have next to no backing or popular support, media hype to the contrary – though Rafsanjani’s and Larijani’s cliques are more enthusiastic about reaching an accommodation with the US, all political forces strongly support the development of an indigenous nuclear infrastructure and pushing Israel into the sea (so to speak). As such, an understanding with Israel is almost certainly out of the question. Iran’s strategic culture – the sum of beliefs and assumptions shared and used by its political elite uses to formulate a foreign policy – can be defined by the following elements: a need for a strong centralized state with competent security forces to preempt ethnic separatism, the conception of Shia Islam as bedrock of the national identity, belief in Iran as a leader of Islamic civilization against Western encroachment (at times verging on the millenarian), a striving for regional hegemony and an acute sense of vulnerability and encirclement by the US (which has troops in Iraq, Afghanistan, and the Gulf States) – which gives Iran an incentive to exaggerate its real military strength to dissuade an attack. This sense of vulnerability is especially acute because Iran is not a monolithic state – though its internal, Persian heartlands, walled in by mountains from all sides, are secure, it has three potential chinks in its armor. The above map shows Iran’s nationalities and Sunni minorities. Though Persians constitute the majority at around 55-65% of the population and occupy the heartlands of Iran’s mountain fortress, there are potential flashpoints of separatist unrest in Balochistan (Balochs), Khuzestan (Arabs) and the northwest (Kurds). 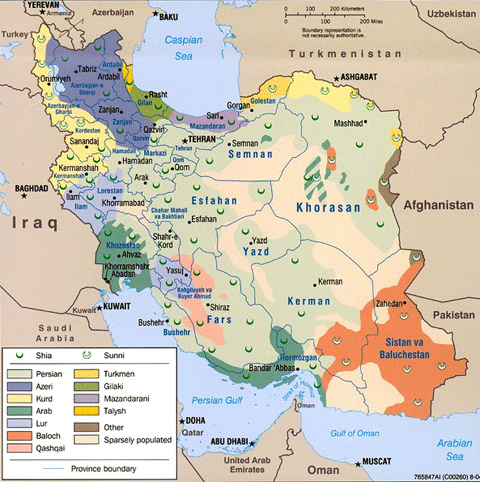 And although the Azeris are tightly integrated into the Iranian nation-state – the Supreme Leader, Khamenei, is himself half-Azeri, as was the failed 2009 Presidential candidate Mousavi – they still make up 20-25% of the population, occupy a geographically coherent position bordering Azerbaijan (whose pan-Turkic elements look up to Turkey), and have a moderately different political outlook (in the recent elections, the race between Mousavi and Ahmadinejad was much closer in majority-Azeri areas than it was in majority-Persian). In the case of a full democratization and rejection of its Islamist legacy, it is perhaps not unlikely to expect a “velvet divorce” between the Persians and Azeris in Iran. 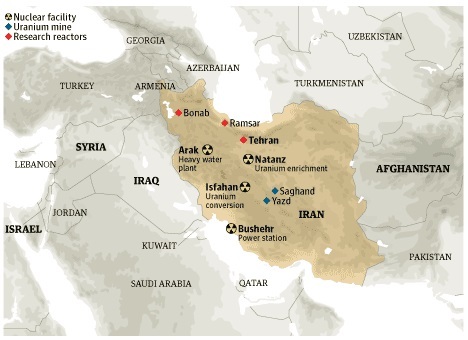 (It should also be noted that tellingly, all Iran’s major nuclear facilities are within the Persian heartlands, just like the USSR tended to concentrate WMD development within Russian or at least Slavic areas). There are credible reports that the US has tried to stir up ethnic insurrections against Tehran since the Islamic Revolution, including by providing them with weapons and intelligence, and rumors that its intelligence services use Azerbaijan as a base to stir up Azeri dissent within Iran. In this secret war, Iran counters by maintaining powerful internal security and intelligence forces, assassinating perceived traitors abroad and maintaining a siege mentality. This starts a circle of confrontation with the US – from manipulating religious and ethnic fault lines in Iraq to force the US to the defensive (though not eschewing cooperation on shared interests like defeating the Taleban), to the ultimate bone of contention – Iran’s pursuit of an indigenous nuclear weapons production capacity and delivery systems. If it is successful in this, then it will severely undermine the US position in the strategically-critical Persian Gulf region since a) the moderate Arab states will observe the American lack of resolve and will move to guarantee their own security through self-help – perhaps ditching the US in the process or swapping it for other partners, and b) it will make Iran near strategically invulnerable to military attack because of the threat of nuclear retaliation. For this reason, it is hard to see the US – not to even mention Israel – ever allowing an Iranian bomb. Unlike Iraq’s or Syria’s nuclear weapons programs, which are / were relatively simple and limited, Iran seems to be pursuing the bomb on a larger scale, aiming to develop an indigenous capability over the entire nuclear fuel cycle and maintaining redundant, hardened nuclear facilities. It should be noted that developing nuclear weapons is rather hard, since they have to be robust, reliable, miniatured and married to delivery systems (gravity bombs, cruise missiles or ballistic missiles launched from platforms ranging from truck beds to nuclear subs). Iran has been having problems with mastering the nuclear fuel cycle, and most current estimates indicate it is still around five years from acquiring its first nuclear weapon. One of the advantages of uranium is that it is easier to build a working bomb with it, since it can do with a simple gun-type explosion to create a critical mass of fissile material needed to produce a nuclear blast – but as written above, acquiring Highly-Enriched Uranium (HEU) is difficult. That is not so much the case for plutonium, a byproduct of nuclear reactors whose enrichment can be accomplished through a simpler chemical reaction (instead of very precise calibration of centrifuges). However, there are two problems in this direction: a) you need a near perfectly symmetrical implosion to compress plutonium core to supercritical mass, necessitating “the precise “lensing” of high-grade explosives” – unlike for HEU, which can do with a simple gun-type design, and b) even though Iran has got the reactor at Bushehr up and running, producing plutonium as a byproduct, it is supposed to be repatriated back to Russia and be subjected to international monitoring – diverting part of the flow will be tricky. Iran continues to have problems in mastering the nuclear fuel cycle, relying on the 600 tons of yellowcake it bought from S. Africa three decades ago (now 75% depleted) and Russian deliveries of low-enriched uranium (subject to disruptions and even full cessation depending on the status of Russian-American relations). Iran is hobbled by poor-quality uranium reserves – its mine at Saghand contains 3000-5000 tons of uranium oxide at a density of just 500 ppm, well below the 750 ppm usually thought to be the limits of commercial viability, and there has been a slowdown in both yellowcake conversion into UF6 at Isfahan and centrifuge installation at Natanz. There have been reports that the slowdown is partly attributable to Iran’s loss of high-quality bearings imports for its centrifuges under US pressure on the suppliers, forcing it to rely on lower-quality domestic ones. …Ahmadinejad announced that Iran had 6,000 centrifuges operating at its uranium enrichment facility at the underground Natanz facility, double the number operating less than a year ago, a worrisome development that shows the progress Iran has made toward developing a nuclear weapon (Washington Post, July 26, 2008). The August 2009 IAEA report said the number of centrifuges had grown to 8,300 (Haaretz, August 31, 2009). El Baradei, the director general of the IAEA, told the group’s 35-nation board that Iran had not stopped enriching uranium or answered lingering questions about its nuclear program (New York Times, September 7, 2009). On September 25, 2009, it was disclosed that it had a second fuel enrichment plant. The United States was apparently aware of the facility, but it was hidden from weapons inspectors (Jerusalem Post, September 25, 2009). Meanwhile, Iran’s exiled opposition movement reported the day before that it had learned of two previously unknown sites in and near Tehran that it says are being used to build nuclear warheads (Agence France-Presse, September 25, 2009). Separating the truth from the spin is amazingly hard, considering that Iran has motives for both exaggerating (to dissuade Israel / the US from attacking it if they know that they will fail to destroy its nuclear program anyway) and concealing (to not invite an attack, duh!, and to give propaganda ammunition to its defenders) its true strength. As mentioned previously, the US has no intention of allowing Iran to get the bomb. 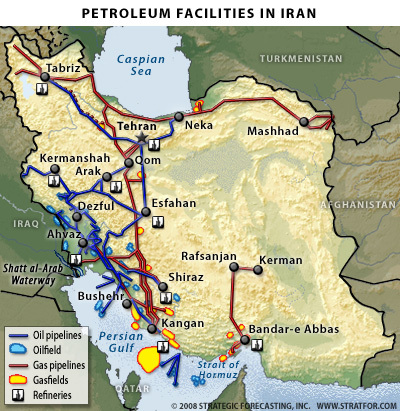 If that were to happen, the new Persian empire would soon displace the US as the regional hegemon in the Middle East – the keystone of the global oil system whose cheap, liquid energy flows underwrite the trinity of globalization, US military predominance and Pax Americana. The moderate Arab states will be spooked into either setting up their own nuclear programs (permanently dooming the anti-proliferation system) or bandwagoning with the new power. Iran will be strategically invulnerable as rarely before, protected not only by its mountain walls but by the threat of nuclear retaliation – this will allow it to meddle in the affairs of its neighbors far more aggressively than it had previously dared (by supporting Hezbollah and Shia militants around the Gulf) and suborn a vulnerable Iraq to its will. However, bombing Iran will not solve problems either. First, its nuclear program is built around deception, redundancy and hardening. Like the recent revelation of a second enrichment built under a mountain on a military base at Qom, Iran only admits to covert efforts at nuclear weaponization when it realizes its cover has been blown. Speaking of which, the facility at Qom also illustrates another feature – the amount of redundancy in its nuclear program. Since the US knew of Natanz, having a second site would have also made sense (and perhaps a third, and fourth, etc, whose existence has not yet been revealed). That way, limited bombing sorties of the sort that crippled the nuclear programs of nations like Syria or Iraq would not work in Iran. They make sure to harden these facilities against US bunker-busters, allowing a margin of safety to account for any black US capabilities. However, in the final analysis the main issue relates to how good US intelligence is on the Iranian nuclear program – if you don’t know the precise coordinated of an underground, hardened target, then no bunker-buster is strong enough to destroy it. Though the US has excellent space-based reconnaissance capabilities, they cannot pick up everything, since “research and development associated with a limited, clandestine nuclear weaponization effort can be smaller and better concealed than industrial-scale facilities for nuclear-power generation”. That would require a sophisticated human intelligence effort in Iran itself, in which the US is rather weak and relies on Mossad. Besides, the Iranians have a plethora of experienced intelligence agencies and are proficient at anti-espionage. Second – and much more important – are the tools of retaliation at Iran’s disposal. This includes destabilizing Iraq through the use of Shia proxies, activating Shia sleeper cells in Saudi Arabia to attack its oil exporting infrastructure, missile attacks against US military bases and Gulf oil infrastructure, coordinating renewed attacks on Israel by Hezbollah, and most importantly blockading the Strait of Hormuz by anti-ship missile batteries and having its big fleet of patrol boats lay down mines. Iran’s production of 3mn barrels per day will vanish overnight, and even a few successful attacks on the 20 oil supertankers leaving the Gulf per day could in effect cut the flow of oil out of the Gulf by dramatically raising insurance rates. Considering that 17mn barrels per day, or 40% of the world’s oil exports pass through the Strait – a figure that accounts for 20% of world oil consumption – even small disruptions will be catastrophic. Not surprisingly, Washington would prefer to first try everything possible to reach a diplomatic solution. The initial signs were seen during the past year, when Obama tried reaching out to Iran and Muslims in general (Cairo speech), but like all idealistic projects there have been no real, positive effects. If anything, Iran’s hostility hardened after what the hardliners perceived as the Western-incited unrest following Ahmadinejad’s summer electoral victory. Having failed in getting the Iranians around him in a circle singing Kumbaya (although Obama did create an impression of benign moderation (liberals) or weakness (conservatives)), things are now going to get more serious. This will be on display in the P5 + 1 (UN Security Council and Germany) talks with Iran in Geneva from 1 October. If the Iranians refuse to budge on the nuclear issue, the US plans to impose “crippling” gasoline sanctions, for which it has been laying the framework for the last several months. It is believed this will put pressure on the Iranian regime, which massively subsidizes gasoline (to the huge detriment of its public finances) and whose automobile ownership has exploded in the past decade. However, the argument could be made that this would just reinforce Iran’s siege mentality and make it more aggressive. Alternatively, the sanctions can be rendered ineffective. Russia appreciated the US giving up on its ABM plans for Poland, but realized it for the symbolic concession it really is and has no desire to reciprocate by handing over its leverage over Iran by cooperating with Washington on sanctions. To ditch Iran, Russia will need more concrete moves like Washington dropping support for Ukraine’s and Georgia’s membership in NATO, halting its plans for Polish military modernization and informally acknowledging Russia’s sphere of influence over the post-Soviet space. As long as these conditions aren’t met, Russia can easily supply Iran’s gasoline needs by pressuring Turkmenistan and Azerbaijan. Similarly, China is unimpressed with rising US protectionism (e.g. recently introduced import tariffs on tires) and also has the spare refining capacity to help bust gasoline sanctions on Iran. Even France has recently voiced reservation after a flurry of high-level meetings between the two, a surprising twist given that France has moved much closer to Washington since 2007 under Sarkozy – though given France’s hardline anti-Iranian position, this may simply be showing its displeasure over Obama’s lack of resolve. Then there is also the question of Afghanistan and Israel. The Taleban have a deep-rooted presence in Afghanistan and are convinced the Americans will have to leave eventually, just like the Greeks, British and Soviets before them. The idea that this place could be pacified and built into a model liberal democracy is nonsensical to say the least. Meanwhile, it is a drain on US military and fiscal resources that benefits Russia and Iran before anyone else, and one that is going to increase as NATO pulls out and if the US increases its troops there. Continuing the campaign in Afghanistan is a strategic blunder and after a face-saving surge the US will likely begin to pull out. First, even as Obama superficially tried to improve relations with the Muslim world by pressuring Israel on halting the expansion of settlements in the West Bank, he made some in Israel question the strength of the US commitment to Israel’s security (despite the fact that this issue has little bearing on it). Second, Israel cannot and will not accept an Iranian bomb, not even if it leads to a clash with the US – to the US, it would be a major annoyance; to Israel, an existential risk, even despite its strengths in ABM. If Iran continues to progress on its nuclear and missile development, an Israeli strike is almost certain. And who can blame them? If a day comes when the world of Islam is duly equipped with the arms Israel has in possession, the strategy of colonialism would face a stalemate because application of an atomic bomb would not leave any thing in Israel but the same thing would just produce damages in the Muslim world… in the future it will be the interests of colonialism that will determine existence or non-existence of Israel… Jews shall expect to be once again scattered and wandering around the globe the day when this appendix is extracted from the region and the Muslim world. Not Ahmadinejad (he of the Holocaust denial) or Khamenei. Rafsanjani, 2003 (chairman of Assembly of Experts and main supporter of Mousavi). Israel doesn’t care if Russia regains hegemony over the former Soviet. It doesn’t care if East-Central Europe becomes Finlandized. And though it faces the prospect of attacking Iran and facing retaliation from Hezbollah, spiking oil prices and renewing its status as an object of hatred in the Islamic world with trepidation, all that is nonetheless dwarfed by the prospect of Iran attaining a nuclear bomb. Most commentators believe Iran is around three to five years behind the bomb, which allows Israel time to stay quiet and let the US indulge in diplomacy and arm-twisting. But this will not be the case indefinitely. There will come a critical point when it judges the Iranian program to be too far advanced already, based on information conveyed by Israel’s extensive human intelligence apparatus in Iran. 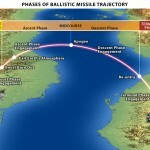 And it will make the decision to strike, unilaterally if need be, but preferably involving the US at the earliest possible date to a) maximize the damage to Iran’s military infrastructure and hence constrict its ability to close the Strait and b) to more thoroughly damage Iran’s nuclear program. In any case the Israelis will have to fly over Iraqi airspace controlled by the US, and since it’s not exactly going to shoot them down, the world will believe the US was complicit in the strike on Iran anyway whatever it does. Hence the rational American response would be to coordinate the attack with Israel from the very start. It’s entirely possible this will be preceded by false-flag operations against American military or even civilian targets that will be blamed on Iran. This gives the impression that the US is going to be prodded into this by Israel, but the reality is that by the early 2010’s its intentions may well have shifted in favor of an attack on Iran by themselves due to domestic unrest (economic problems, Obama’s “socialism”, etc), continuing Iranian intransigence (pursuit of a bomb, closer relations with Russia), Russia’s resurgence (probably) and Chinese expansionism (perhaps). At this point, it will become clear that the optimal strategy for the US would be to a) ease its imperial overstretch by pulling out of Afghanistan, b) deal with the Iranian challenge for Middle East hegemony once and for all, and c) use the resulting freeing of resources to focus more attention on containing its two aforementioned peer competitors, by rerouting military assets to East-Central Europe / the Black Sea region to counter Russia or reinforcing its presence in East Asia to counter China – whichever is perceived to be the more pressing threat to US interests at the time. With time, the US elites will realize the logic of this strategy, and will embrace it. However, there are two negative factors that might end up making an attack on Iran extremely damaging for US global power. By then, Russia will be getting more paranoid about US intentions, assuming it refuses to make real concessions on granting Russia a sphere of influence over the post-Soviet states and continues arming Poland and trying to draw Ukraine, Georgia, Central Asia, etc, closer into its orbit. Russia may up the ante by helping Iran modernize its generally obsolete military equipment, even at a commercial loss, e.g. by arming Iran with modern AA systems such as upgraded S-300, which could make life difficult for all but the most advanced, stealthy and expensive US aircraft like the F-22 Raptor and B-2 bomber (Iran already has 29 Tor M-1 systems, which have a relatively limited engagement envelope but are otherwise very good), or the latest anti-ship cruise missiles, which can pose a significant threat even to the American CVBG’s Aegis defense systems (let alone lumbering oil tankers). Today, as a militarily weak nation Iran makes a show of strength to dissuade hostile powers like the US from attacking it; tomorrow, its strength may become more real than illusory. Second, the consequences of a shutdown of the Strait of Hormuz will only deteriorate even independently of improvements in Iran’s military potential. The reason is that world oil output peaked and will decline relentless after 2011. Meanwhile, the world economy will “recover”, pulled along by the monetary torrent unleashed during the economic crisis. This will again put immense upward pressure on oil prices, which can be expected to rise back up to around 150$ by 2011 or higher (also note that the US dollar will be weakening). The world economy will not long be able to withstand such prices; a war in the Gulf may be the straw that breaks the camel’s back. This is an extremely convoluted issue which revolves around the complex interactions of a number of key actors, foremost amongst them the US, Israel, Iran and Russia, whose policies are shaped by domestic trends, ingrained strategic cultures and their perceptions of the actions, words and thoughts of other actors in the Middle East arena. The idea that the more you know the less you know, and that the only true predictions is that there will be no true predictions, is especially valid in this case. Iran is unequivocally pursuing a nuclear bomb. The military program is camouflaged by a genuine civilian endevour and is highly redundant and hardened against attack, though it faces problems and is still 3-5 years behind maturation. Iran hopes that by acquiring the bomb and mating it with reliable delivery systems (ballistic missiles), it can obviate its chronic sense of insecurity and reinforce its claim to Islamic leadership – a claim that will acquire more credence if backed by the gun. Unlike the US, Israel sees no big difference between Iran’s factions (both viewpoints are justified – though Rafsanjani’s clique is better disposed to the US, all favor nuclear power and the end of Israel). Understandable, Israel is adamantly against the idea of an Iranian bomb, viewing it as an existential threat, and it has made it quite clear that it will strike if Iran does not cease and desist. By necessity, this will also pull in the US into a general aeronaval confrontation with Iran. Considering the threat Iran poses to the Strait of Hormuz, through which 40% of the world’s exports pass, the US sees war as the last resort; however, the prospect of a nuclear Iran is no better, because it would fatally weaken its position amongst the moderate Arab states. Hence, the US will try its best to solve this without resorting to war. Obama’s early charm offensive, grounded in idealism, was unsuccessful and gained him approval from the Kumbaya crowd and a reputation for weakness amongst realists. Unfortunately for him, the Iranians, the Russians, and indeed all serious nations, are ruled by realists. Meanwhile, its perceived support of Iranian “reformists” in the June elections – that is of Rafsanjani’s protégé, Mousavi – enraged the revolutionary-conservative hardliners centered around Ahmadinejad and the IRGC, further reinforced their political ascendancy and drove Iran closer to Russia. Failing to resolve these issues diplomatically, the US will now push for “crippling” sanctions on Iran’s gasoline imports, with the quiet approval of an Israel that is feeling increasingly spurned by the US on other matters (but which likewise wants to avoid war unless everything else fails). What will happen next on this front will be decided within months at the latest, and their success or lack thereof will depend on the actions of states whose interests are if not opposed, then at least orthogonal, to those of the US. The chances of success of presenting a united stance on sanctions on the part of the “international community” are minimal – too many different actors with different goals for multilateral cooperation. The Russian President, Medvedev, in the Aesopian language typical of Russia’s rulers, said on 23 September, “sanctions rarely lead to productive results, but in some cases, sanctions are inevitable”. The irony is that Medvedev will be the one who decides, to a large extent, whether the sanctions will lead to “productive results” – however you define that. He is interested in getting the US to recognize its sphere of influence over the former USSR and back off from militarizing Poland. It is likely that Russia will agree to the sanctions in principle (to give the US the incentive to accede to Russia’s aforementioned wishes in its Near Abroad) – hence their “inevitability”, but considering that Russia believes the US is unlikely to give those concessions, it will likely end up not honoring those same sanctions it agreed to – hence his observation that sanctions “rarely lead to productive results”. This is because, despite America’s problems and quagmires, it is unlikely in the extreme to give Russia the breathing space for recreating a Eurasian empire – a construct it spent half a century trying to contain and undermine (“though Washington is maneuvering considerably now, balancing wars in Iraq and Afghanistan, a resurgent Russia, an intransigent Iran and a global economic crisis, Poland remains a long-term priority”). As such, any US-sponsored sanctions regime will be torpedoed by Russia, which can use its influence over Turkmenistan or Azerbaijan to circumvent any sanctions – and the results of the sanctions will be productive neither for the US (Iran will still get its gasoline) nor for Russia (no fundamental reversal of US policy towards its resurgence). Even if Russia refrains from helping out Iran and honors the sanctions, it could still realistically hope for help from China, which has enough spare gasoline refining capacity to supply Iran’s needs, or it could cut its subsidies. This would be uncomfortable for a regime that buys social stability with gasoline subsidies, amongst other things. This is unlikely to lead to revolution by itself, however – if anything, Iran will try to diminish unrest by increasing the national sense of siege and becoming more aggressive. The third and last blog post on the Iranian Question will be a fictionalized account of how a US-Iranian military conflict will pan out, the weapons that will be used and how they will perform, how players like Iranians, Israelis, Saudis, Americans, Russia, etc will perceive it, the decisions taken by political leaders, and its economic and geopolitical consequences.